Don’t know his name… You will, as this up and coming artist is positioned to reach the world’s stage in the next few years. Keznamdi’s fate as a musician was inevitable, growing up as the son of parents who are lead singers of the internationally known Reggae group—Chakula. Kez spent his early years touring the world and was present while they were recording their 10 albums in the recording studio located in his own home, buried in the lush St. Andrew hills, on the outskirts of Kingston, Jamaica. Keznamdi lived, breathed and slept music. After countless nights falling asleep beside the strum of his father’s guitar, and hanging out backstage with his sisters at Reggae concerts, Kez already knew all the words to his parents’ songs at a very young age, bouncing perfectly on that infectious Reggae beat. “This is not a choice or hobby for me, music chose me. It’s a way of life and the only thing I have ever known,” explains a passionate Keznamdi, describing why his path has already been carved out in stone. Not surprisingly, Keznamdi recorded his first song at 5 years old—“Mix a Color”—an educational song about color mixing, inspired by his mother’s background in early childhood education at Harvard University. Already a natural performer and crowd pleaser on stage, he jumped at the opportunity to perform “Mix a Color” at his mom’s album release tours for her popular children’s album “Save the World” which became a viral hit in primary schools across Jamaica. Keznamdi and his sisters attended music schools throughout their childhood and each child began to flourish as individual musicians in college. Keznamdi’s oldest sister, Kamila McDonald, a former Miss Jamaica World Beach Beauty, popular entertainment TV personality in Jamaica, and married to international Reggae artist, Jah Cure, began recording with established recording artists like Calico (his brother in law) while she was attending Stanford University in California. Kelissa McDonald became a college favorite during her own college years and is also currently pursuing a musical career in Kingston, Jamaica. “Nothing more natural than recording with my sisters, brothers, mother and father,” boasts Keznamdi who has been the catalyst behind many family collaborations and recordings. “All of them contribute to my music in a big way” he explains. Keznamdi began to take his musical career to the next level while at St. Mary’s College in Northern California. He was most excited to come to college in the United States primarily for the opportunity to play Division 1 soccer, another one of his life passions which he still manages to make the time for. Before coming to the US, Kez lived in Tanzania with his family for 3 years, and completed high school in Ethiopia. His multifarious musical sound is a direct product of his diverse and well-traveled background: a sweet blend of Reggae, Dancehall, Bongo Flava, R&B and Rap Music. The eclectic blend of melodies and conscious, positive lyrics in Keznamdi’s music has also been influenced by musical icons such as Stephen Marley, Damian Marley and of course, Chakula. With a guitar always in hand and golden locks on his head, Keznamdi’s music is just as captivating as his image. His personality and sense of humor on stage is an immediate magnet for people of all cultures, seeking to tap into a “feel-good” musical vibration. 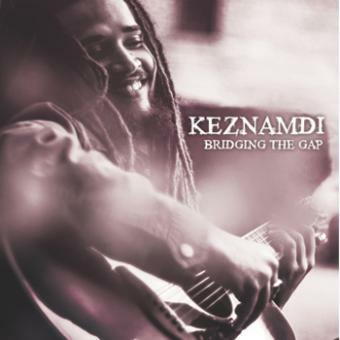 Keznamdi recently released his debut six-song EP Bridging The Gap through Higher Intelligence and Independent Distribution Collective which has received critical praise in the US, Jamaica, and Europe, and was on the Billboard Top 10 Reggae Album Charts and reached #5 on iTunes Reggae Album Charts. The first single and video from the EP release is the hit “Weekend.” TheBridging The Gap EP also features guest artists Chronixx, Kabaka Pyramid, and Calico. He will have a full-length album that will be released later next year.